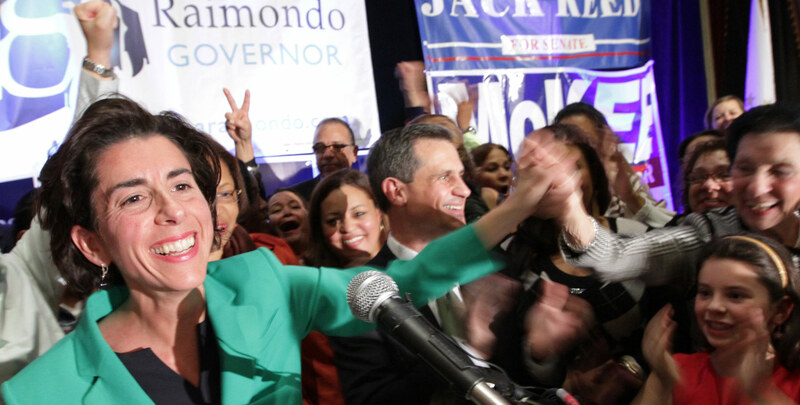 By Tim Murphy on Sunday, January 4th, 2015 at 12:01 a.m.
During her long campaign for governor, Gina Raimondo talked at length about Rhode Island’s problems and what she’d do about them if elected. She made promises on issues ranging from jobs, education and transportation to gun control, business regulations and aid for veterans. To help voters keep score, PolitiFact Rhode Island has launched the Gina-Meter to track Raimondo’s progress. We collected 20 promises from Raimondo’s campaign website. Over the next four years, we’ll review each one to determine whether Raimondo has kept it or broken it. Raimondo gave herself deadlines on some of her promises. She pledged to do two things immediately: establish an anonymous tip line for women who are being paid less than men for equal work and create an equal pay certification for businesses to show they adhere to state and federal equal pay laws. She gave herself a year to review all of the state’s regulations and eliminate "overly burdensome or duplicative rules." She took a longer view on others, including a commitment to double the graduation rate at the Community College of Rhode Island "in my first term." We’ll take a long view as well, as we’ve done monitoring outgoing Governor Chafee’s record on 32 campaign promises. We’re still reviewing the last few on our Linc-O-Meter. Like the Linc-O-Meter, the Gina-Meter has six ratings on a sliding scale: Promise Kept, Compromise, Stalled, In the Works, Not Yet Rated and Promise Broken. The Gina-Meter takes no position on whether the things Raimondo has pledged to do are good ideas or not, only whether she keeps her promises. To see a list of all 20 promises, visit our website, politifactri.com. If you hear any claims from Raimondo or other public figures that you’d like us to fact-check, email them to [email protected]. And follow us on Twitter: @politifactri.